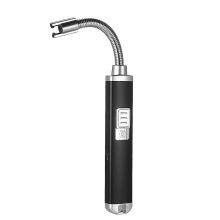 2.8" flexible shaft is 360° rotatable and long enough to lighting something without get burn. Push button control with safety switch. Powered by lithium-ion 280mAh battery, no naked light, no gas, no oil. USB cable included, the lighter can be charged via power bank, laptop, wall plug. For igniting candle, gas stove, etc.